Note: Thanks to Island Press for providing an Advance Reading Copy of this title. Everyone knows I love a good end-of-the-world tale, whether the apocalypse is brought by nuclear warfare, zombie hordes or aliens. However I hold a special place in my heart for tales where the aggressor is nature herself, unleashing a relentless microbial attack against which we find ourselves helpless. Even better? When it’s all our own fault. So what could be more welcome than a non-fiction book about how our natural human fecklessness and recklessness are giving a deadly boost to all kinds of viruses and bacteria? 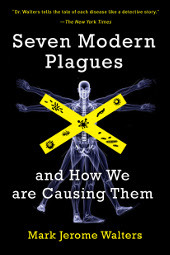 Seven Modern Plagues takes us on a brief tour of the origins and terrifying development of seven illnesses which have become household names. Taking in HIV, salmonella DT104, West Nile Virus, hantavirus, Lyme disease, BSE and bird flu you soon realise just how serious our impact on our ecology has been. Our misadventures have ranged from feeding antibiotics to farm animals in order to promote growth to simply travelling too much and not giving a damn about the consequences. Whatever the cause, the final result is the same – novel diseases are cropping up everywhere we look and we’re running out of ways to fight them. When we ultimately face our extinction event it could well be brought by our own hands. Take for example BSE, or mad cow disease, which had the whole of the UK contemplating vegetarianism for a while in the 90’s. Britain’s livestock farms were chugging along quite happily until from out of nowhere cows started going a little… wonky. Standing around listlessly or suddenly going berserk and endangering or killing other animals, it was soon clear that something serious was happening. Bovine Spongiform Encephalopathy was striking herds up and down the country, alarming the farming community. But worse, the malady which had afflicted the cows was also capable of infecting humans in the form of CJD (Creutzfeld-Jakob’s Disease), throwing the country into a state of panic. Before long the alarm bells were also sounding in other countries, fatalities cropping up both in the cows themselves and those working with them or even eating them. Of course it should have been obvious where the root cause lay but hindsight is always 20-20. It was the brains. No, not the brains of the cows, the brains of the other carriers of BSE-like diseases they were being fed, often unbeknownst to their owners. The practice of rendering the cast-off parts of livestock – organs, brains and all – into a high-protein feed for livestock was widespread yet no-one had paused to consider the possible consequences, let alone the ethical nightmare it raised, until bodies were already in the morgue. Similar tales are repeated across the other six of the Seven Modern Plagues, scrupulously footnoted and referenced stories of over-forestation, predator depletion, antibiotic resistance and more. Again and again the questions arise – Why didn’t we see it coming? Why wasn’t it stopped quicker? How will we stop it happening again? And the answers are always the same, essentially that the drive for ever-greater profits always leaves common sense behind. The modern economic system, ultimately founded on old-fashioned greed as it is, simply isn’t designed to put human welfare ahead of dollars. Hospital wards pay endless testament to this fact and will continue to do so.